So progress has been made, and it’s taken a few years to link the dots. South Elkins looks to be the place to model, now to set some parameters and priorities to guide construction. This is a good exercise to do with any model railroad planning as it helps determine important design factors. Parameters are often physical or specific elements to plan around, while priorities are preferred elements to incorporate into the plan. From these elements, doodling can begin to determine different ways the elements can fit into the space. For many designs, I’ve usually created a scale drawing of the space and made copies of these to sketch track plan ideas. Using discs cut from styrene or a cereal box scaled to the minimum radius curve can be a simple aid in drawing curves or checking clearances. A few discs, a short straightedge, a couple of pencils, an eraser and several copies of your layout area will generate many ideas. I typically plot a main line route then determine siding and industrial locations. But, in the case of South Elkins, I had a better tool to use. I had a copy of a valuation map. Back between 1910 and 1925, the US government required a valuation process for all railroads. Maps were created to document the track alignments, notes were taken on structures, cuts, fills, and bridges, and photos were taken of many structures and bridges. An amazing amount of these historical materials are available to researchers in the National Archives and Records Administration in Washington, D.C. "Riding the Rails Up Paper Mountain: Researching Railroad Records in the National Archives"by David A. Pfeiffer is a must read if you are interested in railroad reasearch. I visited the Archives II location in December of 2005 to review details on South Elkins. Perusing the hand written notes from nearly eighty-five years ago was thrilling. But I was struck by one very interesting thought. I had seen most of the images from the WM valuation books already, as I had purchased a CD of images from the Western Maryland Railway Historical Society. The best part is that the images on the CD were of a better quality than the originals. A WMRHS member had scanned the valuation photos and cleaned them up. Another valuation component I was able to review were the large maps documenting small portions of the railroad. The WM runs about a mile from the Tygart Valley River crossing through South Elkins to Elkins Junction. All of this and a bit more was on one map that is about 2 x 5 feet in size. 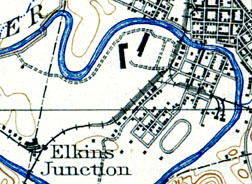 A portion of the South Elkins valuation map is used as the left border to most of the pages on this site. The lettering in the masthead of each page is also from the valuation map. As you can guess, the map helped in planning the model railroad. The layout occupies a 12 x 28 foot garage bay, and I did not want to cram in too much railroad. I chose to stretch things out and leave some space. Even doing this, I found I could have used eight to ten additional feet of length to get a better distance between the Livingston Avenue industries and Elkins Junction. Some stretches were compressed and the connection with the Coal & Coke/Baltimore & Ohio couldn’t be done exactly as the map indicated, but I’m happy with the results so far. As the link suggests, there have been a few versions of this plan. As I laid some ties in late May 2006, I did another change that I had missed on the valuation map. I added the Standard Oil spur from the Railroad Avenue industry siding. Now I need to add that to version 7. Choosing a modeling era or time period can bring focus to industries as well as how locomotives and rolling stock were painted and lettered. Interestingly, choosing an era can often pinpoint a painting and lettering style. On occasion, styles do overlap. The South Elkins story continues as we review Construction Methods.